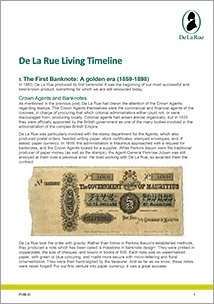 De La Rue has a long distinguished and fascinating history stretching back nearly 200 years. 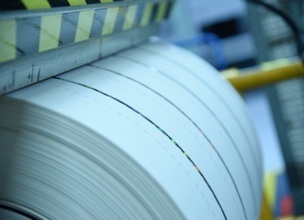 From humble origins as printer and stationer, De La Rue has expanded into the world’s largest commercial banknote printer with a global presence and customers who include governments, central banks and leading brands. Find out more about our incredible story by looking at some key dates in our history - from playing card production to the world’s first ATMs. 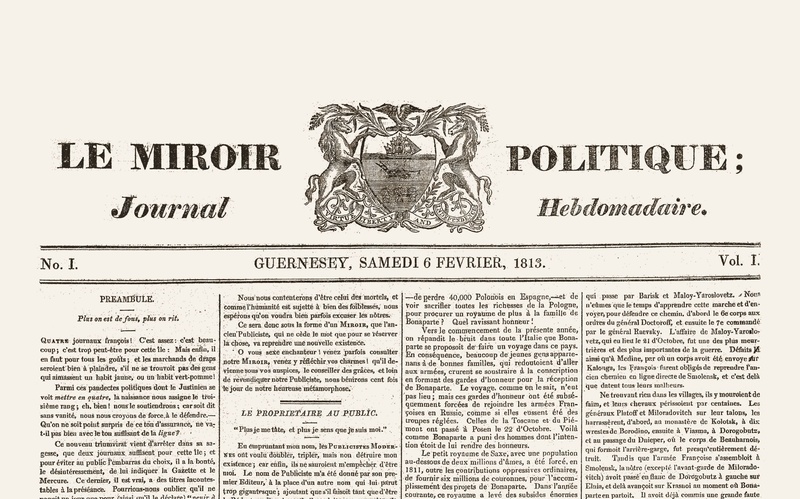 Thomas de la Rue launched his first commercial venture, the newspaper Le Miroir Politique on Guernsey. 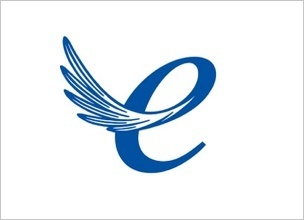 A print business was founded. 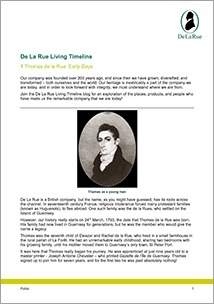 Thomas de la Rue set up in London, originally creating straw hats! Soon he moved into printing properly, experimenting with fancy stationery. The playing card was transformed when Thomas de la Rue registered a patent for 'certain improvements', including early colour printing! 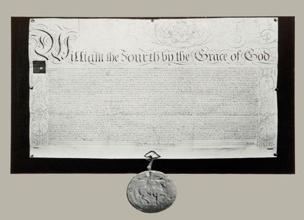 In 1832 he was granted a Royal Letters Patent from William IV. 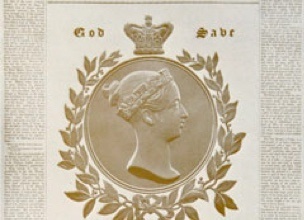 To celebrate the coronation of Queen Victoria, Thomas de la Rue printed a special golden edition of a newspaper called The Sun, which sold out extremely fast. De La Rue received their first order for railway tickets. 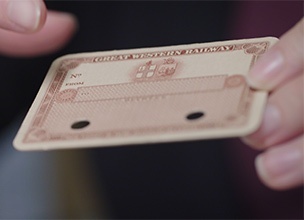 By 1846 they were producing a million and a half tickets weekly, enough for nearly all the trains in the country. 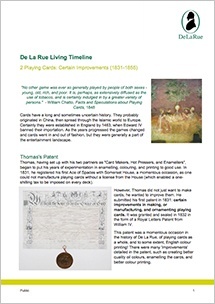 Thomas de la Rue hires Owen Jones, architect and artist, to design the backs of his previously plain playing cards. His distinctive style becomes incredibly influential both in De La Rue and wider card design. 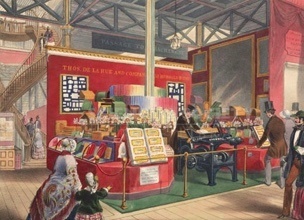 De La Rue had a stall in the central aisle of the Great Exhibition at Crystal Palace, London. They exhibited 289 items, Thomas and Warren were jurors, and the envelope folding machine drew enormous crowds! 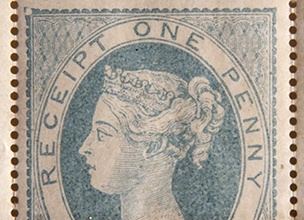 De La Rue was awarded its first stamp contract, for the 1853 Board of Inland Revenue receipt stamps. 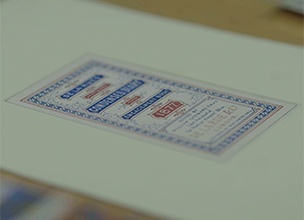 It used its new typographical process - creating the world's first surface printed stamp! 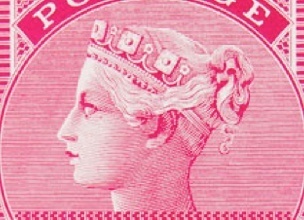 De La Rue won its first postage stamp contract, for the Fourpenny Carmine. It is still renowned by philatelists for its beautiful engraving by Jean Joubert de la Ferté. This led to contracts to print stamps all around the world, and the beginning of a security print business. 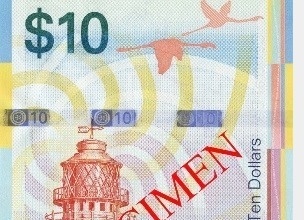 De La Rue printed its first ever paper money for the Government of Mauritius. 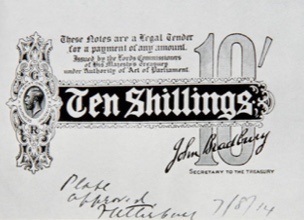 The £5, £1, and 10 shilling banknotes were printed with colour and micro-lettering, representing a milestone in both design and security. 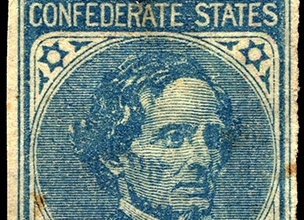 De La Rue supplied, to the Confederate States, the only American stamp ever to be produced abroad: the Five Cents Blue, adorned with the head of Jefferson Davis. 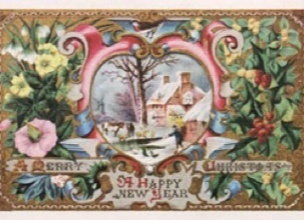 De La Rue printed its first Christmas card, and became renowned for beautiful artist-designed greetings. In 1881 they printed a popular reproduction of the first ever Christmas card. 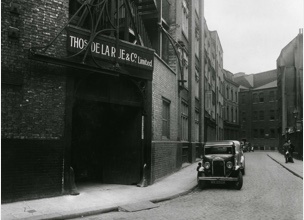 De La Rue opened its new London factory in Bunhill Row, the Star Works. Soon to follow were the Crown Works and the George Works. 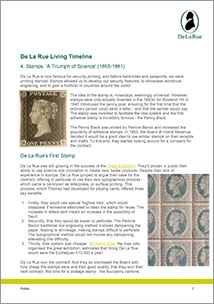 De La Rue entered the pen market with its popular Anti-Stylograph pen. 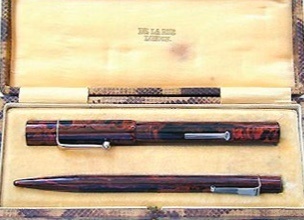 This was followed by the Swift, which was the first pen to feature a shut-off valve, the Pelican, and others. 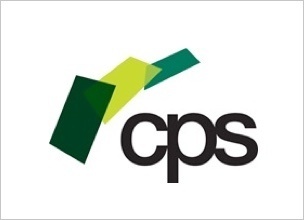 The family partnership structure changed to a private company. 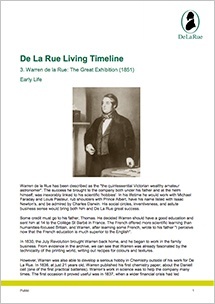 In 1921, the de la Rue family left the business and the company became publically owned. 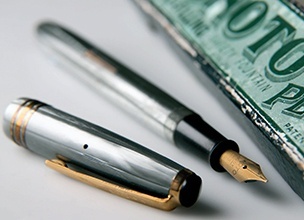 The Onoto pen was launched, which was the world's first plunger-filling pen that used the vacuum principle. It became a heavily marketed, extremely successful line, used Field Marshal Earl Haig, Edgar Wallace, and Winston Churchill. The UK Government commissioned De La Rue to print 10 shilling notes on the outbreak of war, which went into overdrive to deliver 2.5 million notes during the first five weeks of the war. 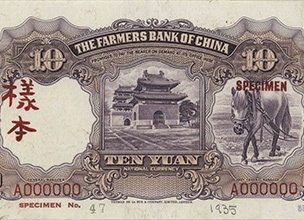 De La Rue received its first currency order from China, whose continued orders would make it a vital customer for the next 15 years. 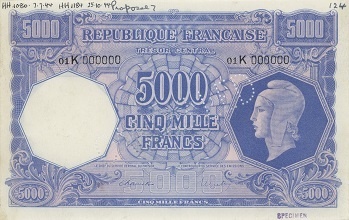 During World War II, De La Rue worked with a number of occupied countries to print currency, which was hidden in a quarry until the war was over, when it could be delivered or picked up. 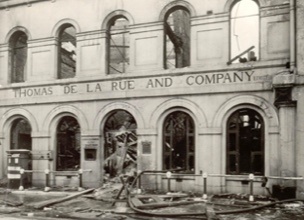 On September 11th, the company's factories and offices at Bunhill Row were destroyed in the Blitz. 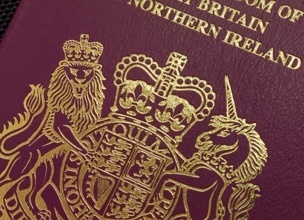 With the help of other firms, De La Rue was able to deliver on all its critical orders. 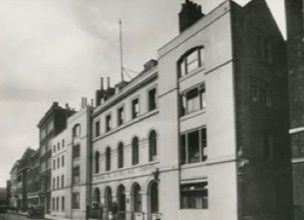 De La Rue was listed on the London Stock Exchange on 27 March 1947. 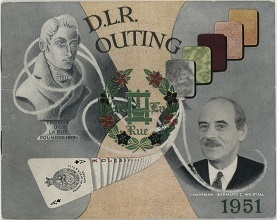 100 years after their success at the Great Exhibition, De La Rue had a large display at the Festival of Britain, and organised a company outing to enjoy it. 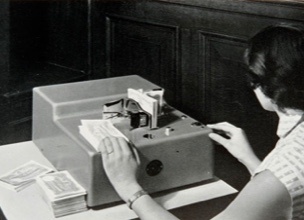 In 1957 De La Rue first marketed a banknote counting machine. 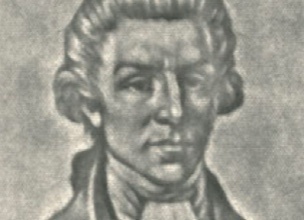 De La Rue Instruments was later formed to run this line. 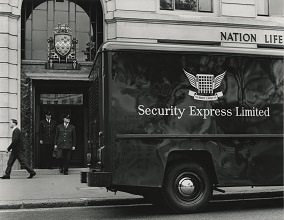 De La Rue set up Security Express Ltd with Wells Fargo, to offer secure delivery to those handling money and other secure items. 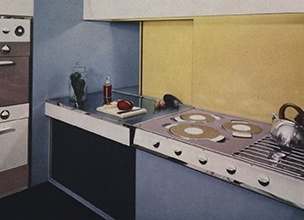 De La Rue formed the new Formica International with American Cynamid to market Formica worldwide. 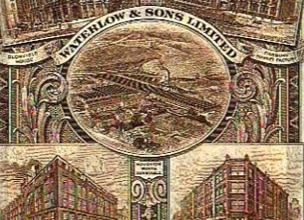 Waterlow & Sons, a banknote, stamp, and general security printer, which had been founded in 1810, was acquired. 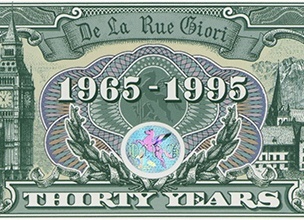 De La Rue Giori formed, becoming the contemporary sole supplier of banknote printing equipment. 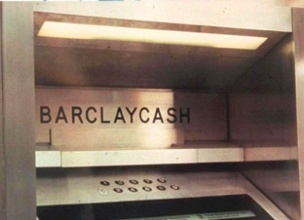 De La Rue jointly developed and installed the world’s first through-the-wall ATM at Barclay’s Bank in Enfield, UK. 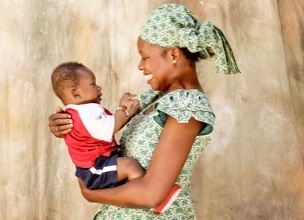 Photo used with kind permission of Barclay’s Bank PLC. 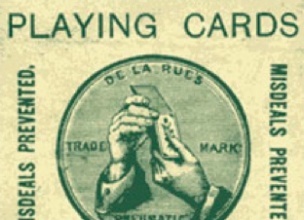 De La Rue sold its playing card business to John Waddington. 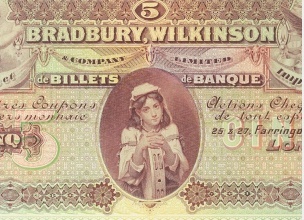 De La Rue acquired Bradbury Wilkinson & Co., a banknote, stamp, and share printer. 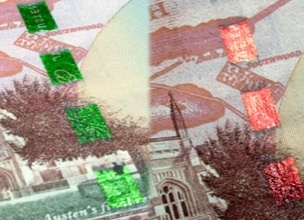 A year later Amblehurst Ltd was acquired, which became De La Rue Holographics. 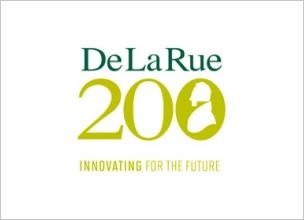 De La Rue House in Basingstoke officially opened as the company's UK headquarters. 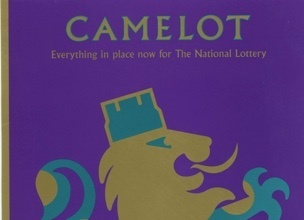 The Camelot Group plc consortium was established with De La Rue as the security experts, which a year later won the licence to operate the UK National Lottery. 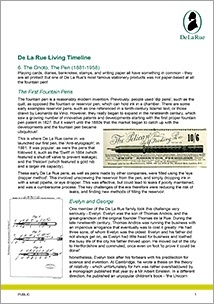 De La Rue acquired Portals Group plc, the manufacturer of banknote paper which had worked with the Bank of England since 1724. 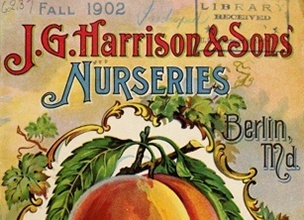 De La Rue acquired Harrison & Sons, the stamp and other security printer, and Ohukuos Cartes et Systemes, which produced smart cards. De La Rue won a 10 year contract to produce the UK passport and the Bank of England renewed the contract to print sterling. 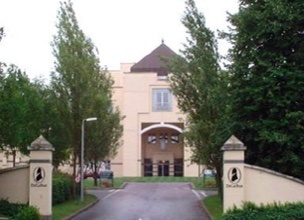 De La Rue sold its interest in Camelot. 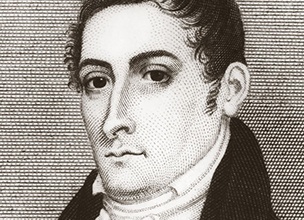 De La Rue celebrated its 200th anniversary. 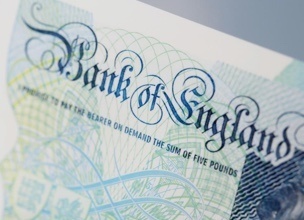 De La Rue won the Queen’s Award for Enterprise: Innovation for its super wide Optiks banknote security thread with a clear window in the banknote, and the associated paper making process. 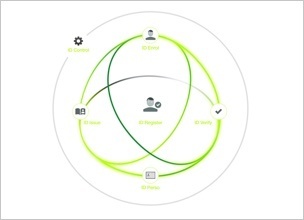 De La Rue launches DLR Identify™, a new citizen centric web based software solution for the secure management, personalisation and storage of citizen identity data. 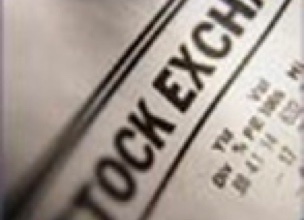 De La Rue sells Cash Processing Solutions Limited. 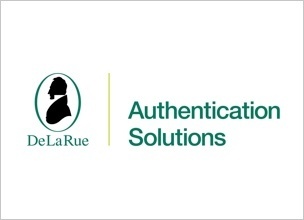 De La Rue launches DLR Identify™ for CRVS (Civil Registration and Vital Statistics), a new solution that will help governments to tackle the challenge of citizen identity management and its foundation. 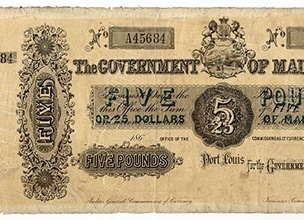 Sir Winston Churchill Fiver, the first polymer banknote in the UK and printed by De La Rue, is issued into circulation today by the Bank of England. 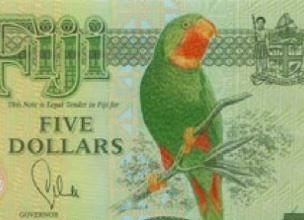 The Central Bank of the Bahamas launches first denomination of new family with De La Rue’s Active™ security thread. 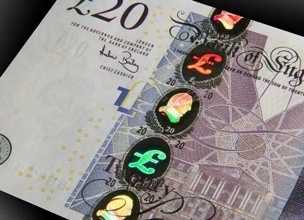 De La Rue acquires DuPont Authentication, a leading global producer of photopolymer holographic films, 3D holograms and associated software. 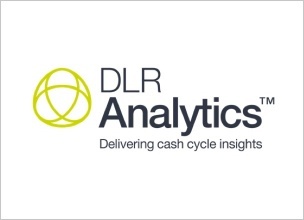 De La Rue launches DLR Analytics™, a software solution for Central Banks to give data led insight of their Cash Cycle. 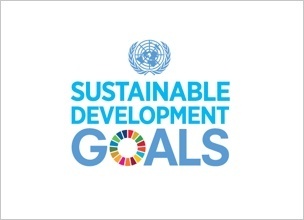 De La Rue announces that it has signed up to the United Nations Global Compact sustainability programme. De La Rue announces that it has entered into a strategic agreement for the Group’s paper business, to be named Portals De La Rue Limited.